I’ve been wishing for fall here. Our trees are still green. The weather’s still hot and muggy. But it’s nearly October, and time to think autumn! This week we’re co-hosting the inspiring Virtual Book Club for Kids, which shares weekly book-themed learning activities for preschoolers. The theme this week is LEAVES! I created a fall pre-writing activity for this week’s featured book: Leaf Man by Lois Ehlert. 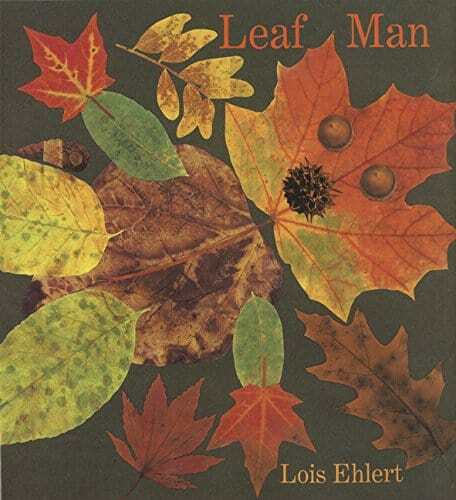 The story and the illustrations are intertwined in Leaf Man. It’s really hard to explain! It’s long on whimsy, short on plot, and full of fascinating collages. All in all, it’s just right for preschoolers. The prewriting activity I’m sharing here isn’t directly related to the story. It’s just inspired by the creative use of leaves. 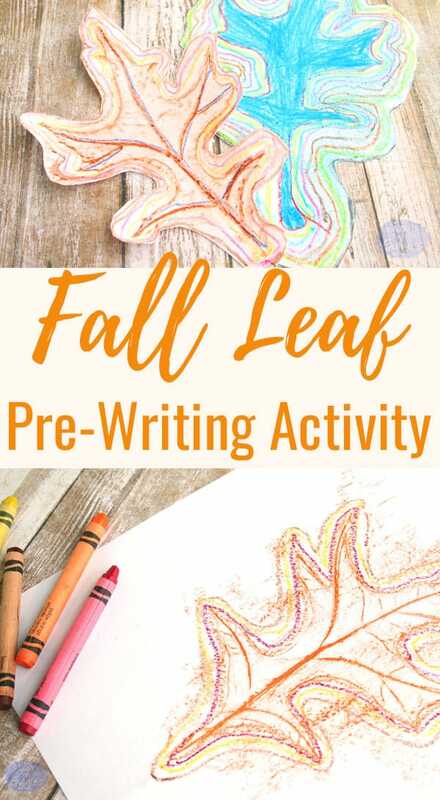 We used fresh green oak leaves for our project – it was fun being able to transform them into an autumn craft/learning activity. 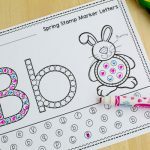 The fine motor practice here is loosely inspired by a Montessori activity called Metal Insets. Metal insets are meant to strengthen little hands and give them practice at controlling a pencil, among a long list of other goals. My girls, now in first grade, made the cutout leaves pictured here. I don’t think they could have cut them out that well a few years ago. So save the cutting for older siblings, do the cutting for your child, or just leave the leaves uncut. It’s hard for little hands to hold the leaf and paper still. But if they slide around, you won’t get a clear leaf image. Affix each leaf to a sturdy surface. We used double-sided tape onto the back of old posterboard. You could also glue the leaf to cardstock or tape it onto your tabletop. 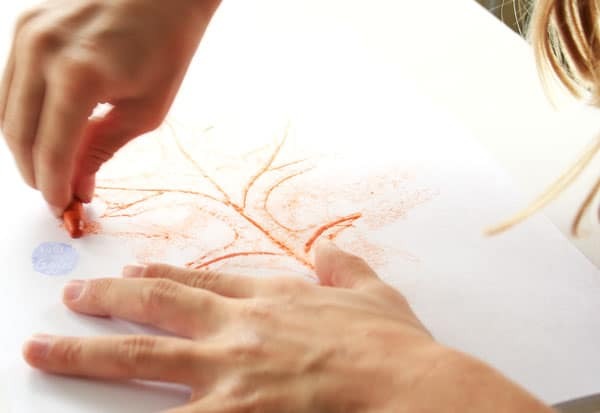 Next, cover each leaf with a sheet of paper, and tape the paper to the table or posterboard with masking tape. Rub the leaf with the side of a crayon as shown. 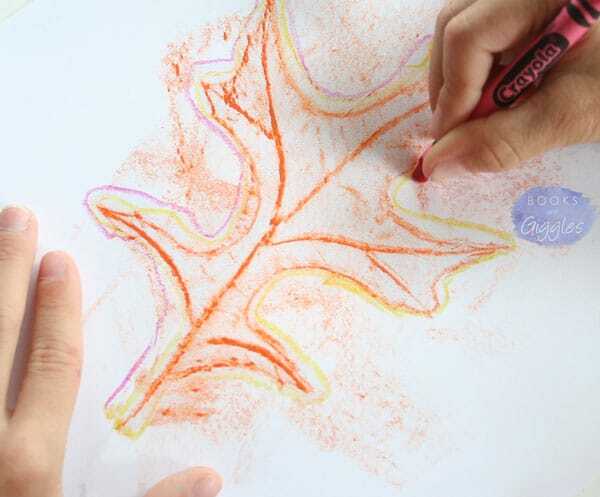 Trace around the leaf with various color crayons. 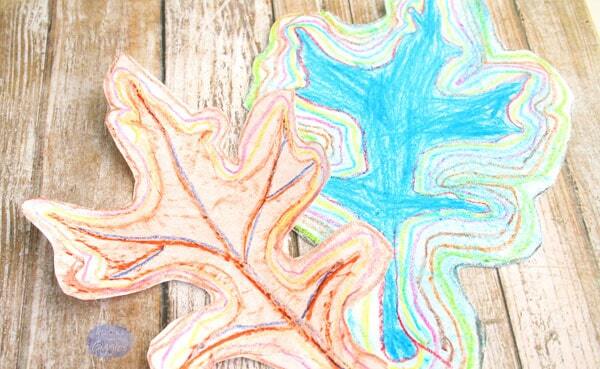 Older children may also choose to cut out their leaves. 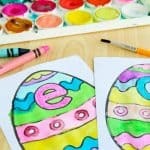 Younger ones may only do the rubbing and not the outlining. 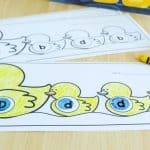 Fun activity for pre-writing skills! Don’t you just love autumn colours. 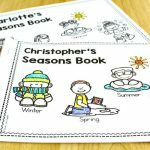 Such a fab craft to compliment the book (Which we love! ).